Most people choose dogs or cats as pets, or perhaps a hamster, ferret, fish or bird. Sarah Heydon grew up that traditional route as well with cats and dogs, but when she got a pet pig named Bullet about a year and a half ago, it changed her life. 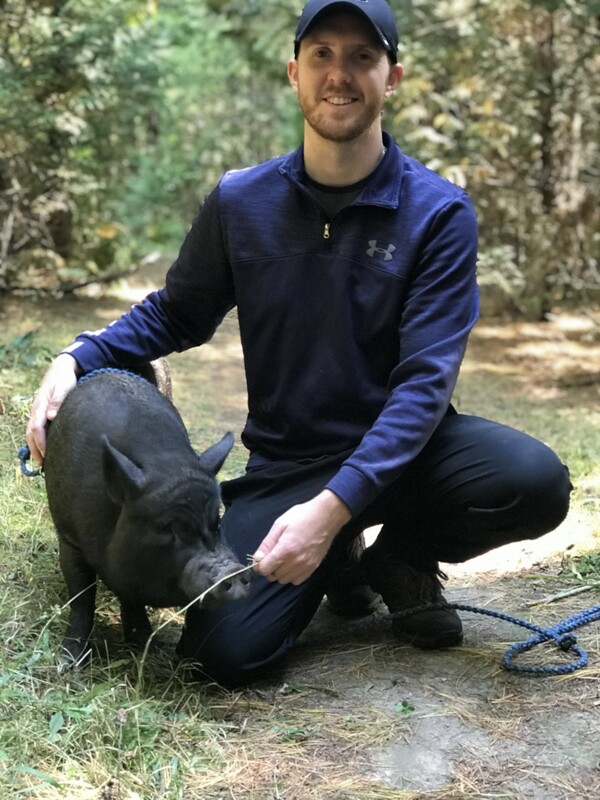 She completely fell in love with Bullet—they actually even share a birthday, May 24th—as have all those that meet this outgoing, adorable piglet at events and on walking trails. Indeed, he’s becoming a bit of a celebrity—and even has his own Instagram page. But before we continue with the now about the impact this mini-pig has had on her and others, let’s back up to the beginning, to the Once Upon A Time. Sarah’s journey with Bullet began when she saw a post that someone had put into the Peterborough Buy and Sell Facebook group. The woman was trying to sell a litter of pigs, and specified "For pets only, not food." This was when Sarah realized that perhaps having a pig in her home was in the realm of possibility. The only connection to pigs Sarah had up until this point in her life was limited to the fact that she had made a deliberate choice not to eat pig meat as a child, something she’s carried into adulthood now as a vegetarian. Sarah brought the piglet home to her place in Peterborough that she shares with her partner Shane Curry, potty training him in her backyard in a matter of a day or so, and training him on the leash quickly as well. She changed his name to Bullet, as she is an Armed Guard and shoots at a firearms club in Cobourg. Bullet spends some time in the backyard, but is a bit of a diva compared to the younger pigs Sarah has now, preferring to be warm and cuddled up inside. Just like many humans, he is not a big fan of the rain or the cold. He’s also had a bit of a rough stretch lately, as he lost his best buddy Pearl the Pig (also adopted), who Sarah had to put down unexpectedly this summer due to a twisted intestine that she couldn’t recover from—even after surgery. Bullet and Pearl loved to go with Sarah and Shane to the Harold Town Conservation Area trails and explore. Bullet got depressed when Pearl passed away, and at this point turns up his nose a bit to the seven month old pigs—Piper (the “P” a nod to the deceased Pearl) and Ivy—that Sarah has now. Bullet gets recognized a lot by other pet owners and hikers on the Harold Town trails, many of which know him by name. “I did not want to miss out on my favourite past time of hiking just because I have a pig rather than a dog,” Sarah tells PTBOCanada. “Harold Town is his 'happy place’.” Indeed, pigs—like dogs—love going for walks. People regard Bullet in amazement when they spot him on the trails. He is a wonder to watch as he sprints through the forest—pigs can run a 7 minute mile—stopping to eat grass, rolling in mud, all the while never leaving Sarah’s sight. ”Bullet will explore off the trails in the trees while we walk, but he’ll come when he is called if he falls behind,” she says. Sarah gets asked a lot of questions about Bullet—”You have a pig? Why?”—and loves educating people on how these pot belly pigs actually make great pets. Some people Sarah meets on the trails and events and beyond have told her that meeting Bullet has made them second guess what they eat, or stop eating pig products completely. “I can't help but declare Bullet as Peterborough's official ambassador for pig education, and I am merely the Liaison,” Sarah says. -> Mini pigs will grow to between 50 to 300 pounds, at an interval speed until approximately five years of age. -> Sarah feeds him human food (of course, not bacon) rather than pellets, such as grain, veggies, fruit, seeds, nuts and Cheerios. -> There is no such as “micro pigs” that stay small. “Micro pigs do not exist—it is a marketing scheme developed by breeders to sell their litters at higher price,” Sarah says. Speaking of happy, now on to that celebrity factor that Bullet is developing. His friendly, outgoing nature—not to mention his cuteness quotient—means that his cool factor goes beyond Instagram. He has met so many fantastic people, and become so socialized, that Sarah has started carting him around to many local events. This includes several with the Peterborough Humane Society, Peterborough Vegfest and the Keene Pumpkin Festival, to name a few. People love getting their pictures taken with Bullet, who brings joy to adults and children alike. Chill time at home involves Bullet, Piper and Ivy sleeping on the couch while Sarah and Shane are at work. “They get gated into the living room since Bullet is known to help himself to snacks in the fridge,” Sarah says, adding that the pigs (like other animals) like to be right up in bed with the couple—Shane hates this, Sarah not so much. Sarah’s affection for and perspective on pigs has changed her life. 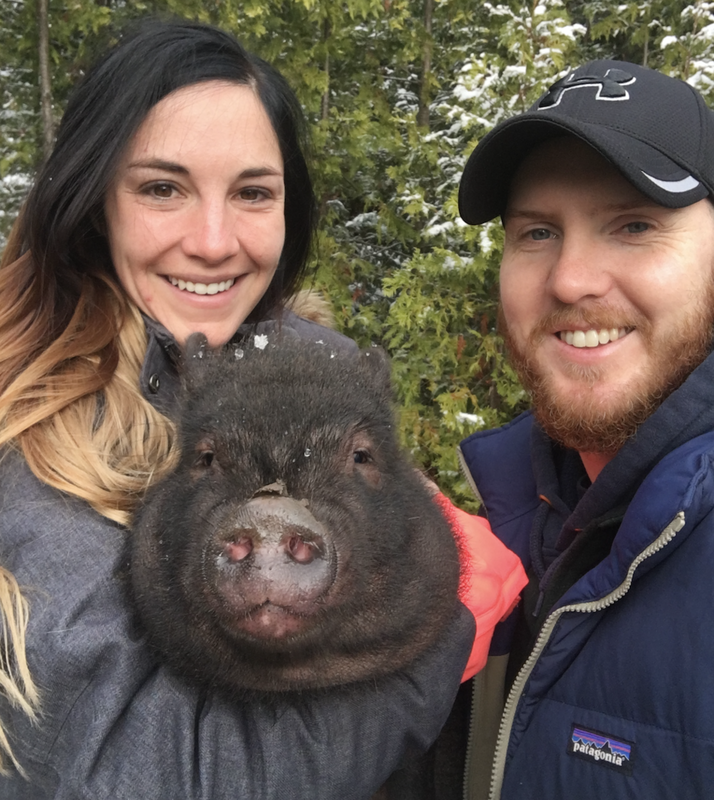 So much so that the couple have begun looking for a home in which they can have the space to rescue and foster other pigs—a passion project inspired by Bullet and a tribute to Pearl. “Shane and I will look for a home with upwards of three acres,” she says. She knows full well that fostering and rescuing pigs is a bit of a battle financially, but Sarah is dreaming big and one can’t doubt that she will find a way to make it work. Pigs are her passion.